Michele Savoia, 55, also known as Savoia the Tailor, was last seen leaving Marquee New York on 10th Ave. at about 4 a.m. on Thursday, the same day Fashion Week ended. 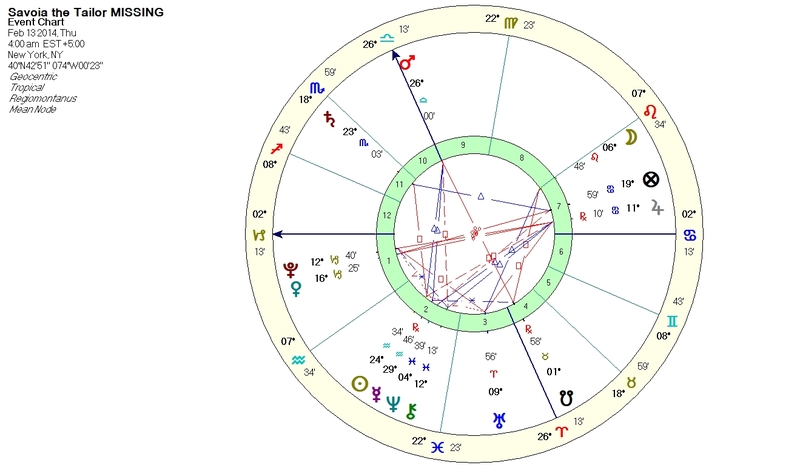 William Lilly read such charts using horary principles. The ASC represents the missing person. Here the ASC is ruled by Saturn which lies in Scorpio in the 11th Regiomontanus house. Saturn in Scorpio is without any essential dignity, i.e., peregrine. The Moon, which co-rules the missing person, closely conjoins the 8th cusp of death — an ominous portent. The Sun, which rules the 8th of death, has just squared ASC ruler Saturn. I find in event charts that the ruler of the 8th just separating from a recent square to the ruler of the ASC is an unfortunately indicator. In addition, the retrograde Mercury will conjoin the horary sun on February 17th and then square the horary Saturn on February 19th, thus reactivating the square via translation of light. Saturn (ASC-ruler) conjoins Emerson’s Point of Death. Saturn (ASC-ruler) conjoins the medieval Part of Death. The Sun (8th ruler) opposes the Part of Water Journeys. An angular Mars on the MC ruler the end-of-the-matter 4th cusp and is almuten of the 3rd cusp of local travel. Mars also disposes ASC-ruler Saturn in Scorpio. Mars is in detriment in Libra. This chart looks quite ominous. It seems likely that the missing tailor had some kind of travel accident and may have drowned. With the recent cold weather in New York, perhaps he slipped on the ice and fell into one of the city’s rivers. Horary is not infallible, and I hope for the sake of the missing person’s family and friends that this analysis is wrong and that Mr. Savoia will be found safe and sound. There is little in the chart, however, to support a positive outcome. The chart for the moment he was last seen was quite accurate. This entry was posted in Astrology and tagged http://www.nydailynews.com/blogs/theshack/2014/02/cops-help-us-find-missing-fashion-designer, missing person. Bookmark the permalink. Did you see that this man’s body was found in the water, near a pier and that he may have slipped off the gang plank while getting onto a yacht after a night out??? You were right on with you analysis and yes, this is a very sad event. Yes. The news kept broadcasting the fact of his disappearance with the time he was last seen, so I decided to cast the cast and post an interpretation. Shortly after I posted it, there was a news bulletin that the body had been found. The chart was fairly accurate in describing the outcome. Interesting observations. I don’t think the autopsy is complete yet, so more may emerge about what actually happened.